I haven’t played Monopoly since about 1981, when my friend Chip and I were playing with his younger sister, Meig, and in retaliation for his landing on one her properties with a hotel on it, we made a rule that “mergers” were possible and then immediately colluded to bankrupt her as quickly as possible. Meig responded by flipping over the board and shouting for their mom, which we richly deserved. For many, cheating and making up new rules in the middle of the game is just part of playing Monopoly. Well, it seems that the people at Milton Bradley have been listening. In addition to the standard game, the Cheater’s Edition comes with fifteen cheat cards with various little scams for players to attempt during the game — taking a little extra money from the bank, moving someone else’s token during your turn. If you succeed, you apparently get extra cash or a free hotel for one of your properties. But if you get caught, there are new consequences. Either you have to pay out money, or instead of being sent to the “go to jail” spot, in what seems like a distinctly reality t.v. kind of twist, now you also get literally handcuffed to the game board itself. Say what you will, it’s a very interesting way to try jazzing up Monopoly, which we’ve all been jazzing up on our own since the Great Depression. When the game debuts, I’m sure there will be any number of thoughtful op-eds and blogs about what it means that breaking the rules is now officially considered part of the game itself. But I wonder if that’s really the point. Part of me wonders if the point is not about giving permission to cheat, but rather about introducing formal punishment for those who are caught doing it. I wonder if the point is actually to enshrine a new kind of vigilance about the rules. Because whatever thrill there is to be found in cheating at Monopoly, surely it will pale in comparison the thrill of seeing sweet, swift justice being done–oh, the pleasure of seeing your older brother or his friend now a prisoner, their arrogance finally exposed for all to see! No flipping the game board in frustration ever again — let the truth be proclaimed to the last hotel on Park Place! Stepping back, we can have such a strange relationship to winning, can’t we? We can turn almost anything into a contest. Maybe the game is Monopoly…or maybe the game is showing the world who your older brother really is…but in any case, let the games begin. Pastor Shawn would probably call that the ultimate troll. But if gestures like that suggest our strange relationship to winning, the deeper truth is that we have an even stranger relationship to living. A life with winning at its center — with winning as its purpose — can turn out to be strangely misshapen. We are built for more than just that. That points to Scripture’s view that there is something in us that is bigger than the vicissitudes of daily life…that there is something transcendent about our lives in God. Ecclesiastes takes the view that God is to be found as much in losing as in winning, and that the point of life is to seek what abides, whatever the circumstances may be. Our Gospel this morning is in that same vein. As we’ve heard in Mark’s telling, Jesus has begun to speak directly about what will happen in Jerusalem — to tell the story of Good Friday and Easter that are yet to come. It’s telling that what Peter seems to hear is just the Good Friday part, and he even goes so far as to take Jesus aside and rebuke him. Peter is not entirely wrong, of course. The other gospels record that Jesus’ preaching began to grow more foreboding as he got closer to Jerusalem, and that some of those who had been following him began to fall away. So we can have a certain amount of sympathy with Peter, I think. Peter is a loyal lieutenant who sees how important it is for this movement to succeed, and he wants to keep Jesus on message. But on some level, maybe he’s also simply afraid of losing. In fact, he’s so afraid, that he can’t hear that Jesus is talking about this thing that will happen…this moment in the life of God and the world that is going to blow the doors off. What is about to happen is beyond those little categories of winning and losing, because God is so utterly beyond those little categories, and so utterly greater than these little games that people play. Peter isn’t quite ready to hear that. He’s going to have to learn that lesson the hard way. But for us, maybe it doesn’t have to be quite that hard. For one thing, I’m very certain God doesn’t want it to be. If we’re having trouble hearing God, I’ve found that usually it’s not because God isn’t speaking…it’s typically because we’re having trouble really listening. This morning, I’m particularly wondering if the prospect of winning or losing might be preempting much of our regularly scheduled programming, kind of the way the Olympics preempts so much else. Do you watch for the medals…for who wins, or for who loses…or do you watch for something else…do you watch the games in another spirit? Do we spend our time and energy focusing on life’s winning moments…or trying our best to steer clear of life’s losses? Or do we seek to live in a different spirit? If we’re not careful, we can come to misunderstand what the real victories are — and the losses, too. And yet wisdom is always eager to teach us, if we are willing to learn. For the last couple of years, our daughter Grace has been involved with Girl Scouts, in a troop that meets right here at the church. Part of that, of course, is that she is slowly beginning to gather merit badges for various kinds of things. And there are times I look at her vest with its various badges, and I wonder, you know, what would it be like if we adults walked around with vests like that? What would our badges be? Would we only carry the badges of our victories? Or would we have badges for the wisdom we gain in other ways? Shouldn’t there be a badge about caring for an aging parent or spouse…a badge for getting downsized at work, or a badge for divorce? Isn’t there wisdom in those moments? Isn’t there holiness in those moments? And if our answer to that is no…or not really…then what does that tell us about whom we’ve become? As we prepare our hearts for Easter this year, we’re invited to rejoice God’s victory over death and over all that diminishes human life. Yet it is the victory of a wisdom that is bigger than winning and losing as we typically think of them. Because in Good Friday and Easter, God shows us that love is always present, always at work, always poised to make a difference. Whatever the game is, Easter breaks its every rule. Because God is never finished with us. God is never out to beat us. And life is not either. No matter what we may do, no matter what may happen, we are never handcuffed to the board. And so we are invited to live our lives, learning as we go, and finding God in the midst of all of it, good and bad. In these weeks of Lent, as we live with Easter particularly in mind, may we ask ourselves what it is for us to win and to lose, and invite ourselves to listen for the God who abides with us and loves us above and beyond any contest, any challenge, and any final score. This entry was posted in Sermon on February 24, 2018 by maxgrantmg. This morning’s Scripture challenges us to think about forgiveness. In Genesis, we have just a small snippet from the longer, wonderfully complex story of Joseph. If all you know is the part about the Technicolor dream coat, you’re missing out. In today’s small bit, Joseph forgives his brothers for their treachery way back when and he suggests that, as he sees it, it wasn’t their treachery that was happening, but actually God working in one of God’s mysterious ways, putting the wheels in motion for Joseph to save them all and many others besides. So Joseph says, “You meant to do me harm; but God meant to bring good out of it by preserving the lives of many people, as we see today. Do not be afraid. I shall provide for you…” (Genesis 50:21). Then he goes on to tell the parable of an unforgiving servant, generously freed from a multi-million dollar debt for which he is on the verge of defaulting, but who then fails to show that same generosity toward someone who owes him about forty dollars. The unforgiving servant is chasing after a mote of debt, having apparently forgotten the crushing beam of his own debt that has been lifted from him. As any of us consider what to do when we are asked to forgive–whether to do it or not…to mean it or not…to expect something further or not…as any of us consider what to do when we are asked or challenged to forgive, let us be mindful also of that within ourselves that might need forgiving. Maybe, as Genesis suggests, God is somehow already at work for a greater good, even in what hurts us now. Or maybe in those moments when we are especially poised to judge…ready to deploy the long, bony finger of blame…we need the humility to remember what it is to need forgiving. We all do things we later come to regret and then can’t easily fix. But what I think Jesus wants us to see this morning is that while it is bad, indeed, to do wrong…to sin…there is another kind of danger that lurks even in being right. So often, it turns out that we’re not quite as right as we think. Quite often, we also find that being right doesn’t mean quite as much as we might be inclined to believe. Well, if you have really sinned, then you know that all too often, there is a point where someone who is mad at you, and justifiably so, leaves off with being right, and instead becomes self-righteous. It does not mean you were not wrong to do whatever it was you did. And yet, somehow, the moment is not quite so simple as that. Back in the 70s, the psychoanalyst Eric Berne argued that a lot of human interaction was not all that spontaneous, but was actually a kind of endless sequence of unconscious games people play (which is also the name of his book). In fact, to prove this idea, he went on to name about fifty of the most important of those games. “Ain’t It Awful” was one–the kind of interaction we might have while waiting on a grocery store line, or at coffee hour–those strange, one-upping kinds of conversations where you talk about how the world is falling apart, with each example more awful than the last. But the game that especially applies this morning is the one Berne calls “Now I’ve Got You (You SOB)”–it describes those moments when someone is not so secretly gleeful to have caught you doing something wrong, because whatever it is, all their totally unrelated anger at you for anything and everything is suddenly poured into that one specific thing, and on that narrow question, they have you dead to rights. If Berne is correct, then the simple question of right and wrong doesn’t turn out to be all that simple, much of the time. And if there is a part of us that wants it to be, well, Jesus would have us be very wary of that part of ourselves. 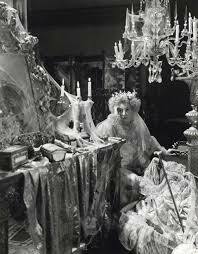 Does anybody really want to be Miss Havisham, the old lady in the gloomy mansion, still sitting there among the cobwebs in her decaying wedding dress, with the wedding feast still on the table, withered and spoiled? Clearly, she had been wronged by the man who had left her at the altar all those years ago…and yet…awful as that was…unfair as it had been…though she was clearly in the right to be so hurt…somehow her life had not become what being right is supposed to look like. Instead, she had let herself become prisoner to a kind of truth that could not set her free. The truth that sustains us is the truth that challenges us…that expands us…that teaches us to open our minds and our hearts, and not to close them. So if it turns out that that kind truth is not the truth we’re after just now, Jesus would have us look in the mirror–and look to God. And he would have us hold back on deploying the long, bony finger of blame. It isn’t that we’re wrong, entirely. It isn’t that there isn’t something there. It’s that, if we’re not careful, our lives can shrivel up like Miss Havisham’s wedding cake. If our lives become nothing more than round after round of the “Now I’ve Got You” game, then really what we’ve got is nothing at all. That said, if all we do is forgive everything…all the time…it isn’t long before we end up being doormats. After all, there are some things that really shouldn’t be forgiven…some wrongs that cannot be justified. If we believe in a moral universe, then, on some level, we must hold that to be true. Jesus himself says: “if anyone causes the downfall of one of these little ones who believe in me, it would be better for him to have a millstone hung round his neck and be drowned in the depths of the sea. Alas for the world that any of them should be made to fall! Such things must happen, but alas for the one through whom they happen!” (Matthew 18:6-7 REB). God’s justice is a real thing. But more to the point, if our great invitation and our great challenge is actually to love one another, clearly part of that is to care enough to say hard things. And to sit there listening when someone has hard things to say to us. Working things through is a part of forgiveness. And while it not always possible to work things through successfully, it is far more faithful and far more loving to have tried valiantly and failed than it is to pretend that there was never anything to forgive in the first place, and to breezily let things go. Christ calls us to love one another, not to enable one another. But without one another, we cannot become the people that God calls us and needs us to become. I can’t help but think of Miss Havisham again. Because for all her failings, there are also the failings of all those people she once knew…the people who should have been there to push her…with great patience and great love, of course…but nevertheless, the commitment to her good that would help her find the strength to live again. The story seems to suggest that this would not have been possible. And perhaps not, in a story. But in life, it is possible. And it’s important that we try. That’s part of what loving each other is all about. Now…if I’ve made this case correctly, by now you should be playing in your mind some sort of highlight reel of your relationship with someone. Some people have the premium package and are sort of surfing between several different highlight reels at once. That’s o.k. But as you’re doing that, you may see that, just as Genesis argues, there was something very hard but ultimately good in some moment you’ve been carrying that has seemed unforgiveable. Or you may simply hear the call of Jesus to love someone enough to try again…to believe enough in their capacity for change and growth that you are willing to try working things through. Or if that window is no longer open, then you may hear the challenge to live without bitterness, without the self-righteousness that finally makes us smaller. But whatever you hear, whatever it is you see on that highlight reel, hear again Jesus’ invitation to live fully and joyfully. He calls each of us to come and find new life in him…to live once more…with feeling. May we find the courage to do just that. This entry was posted in Sermon on September 19, 2017 by maxgrantmg. It’s always so wonderful to see the sanctuary so blessedly alive as it is on Christmas Eve. Some people are dedicated, eight o’clock service kind of people, and we expected you, and here you are, and we love that. Others here are the kind who get everyone motivated and come with a whole pew’s worth of companions, sort of like modern-day shepherds, and of course, we love that, too. And then some of you are people who managed to slip away from wherever you were and come to church. At this very moment, back at your house, they still may not even know you’re gone. Sneaky devotion is a much bigger part of the Christian tradition than you’d ever believe, from the catacombs of ancient Rome to the house churches of modern China. We love knowing that we may be just counter-cultural enough that someone still sees us as a secret to be kept, a people too scandalous to know. But whether you have been long-planning to come or just find yourself here right now because you were driving by, you’ve come because tonight is the night when we tell the story. We’ve been building up to it for weeks now—all around the world, we’ve been building up to it. All around us at this time of year are reminders that Christmas touches us in ways that no other season quite does. It speaks quite deeply to us to see lights in darkness, and greens indoors, and wreaths with red ribbons on doors—it’s as if the world decided to dress up for the occasion, and to make the kind of effort that is harder and harder to make these days. We may not do it in other times of the year, but we’ll do it for Christmas. It’s one of the ways that we show that there is life in us yet—and memory, too. The memory of Christmases past, maybe, when for so many people, the world seemed to come alive and there was so much celebrating to do—so much cooking and singing and zooming around after this or that. Is that how you remember it? So many people will look back and recall that there was just so much that went into it…that you could not help but get caught up in the rhythms of it…that you could not help but be delighted to see so many others you might not otherwise expect get caught up in it, too. After all, if Ebenezer Scrooge could come around and get into Christmas, how could it be any surprise that others did too: the old lady in the apartment down the hall, who seemed to disapprove of children, making gingerbread men for your family, or a city bus driver, improbably wearing a Santa hat, or your grouchy and impatient great-grandfather, smiling as you brought him egg nog? That might have been a long time ago, in a world we’ve long-since left. But almost like veterans, squeezing into an old uniform on the morning of Memorial Day, we remember at Christmas—we remember, and we honor, and we try to be true to the memory of that other, bygone world. And so, here we are, all these years later. And if now the blazer has gotten a little snug, or if words were exchanged as you realized you were running a little late—if you discovered that, yet again, your brother-in-law has inattentively blocked in your car—or if your children have come home and were actually telling you about their lives, and in this great moment, out of the corner of your eye, you saw that your husband was discreetly checking his Blackberry and missed the whole thing—well, nevertheless: here we are now. And may we each, in our way, find some way to connect with those Christmases past, and bring some of their warmth, and their surprise, and their belief in the capacity for deep transformation into our hearts and into our lives, not only tonight, but in the days to come. Or maybe that’s not how you remember it. Maybe as you look back, Christmas has always been at the center of a harder season—a time when tensions always used to boil over, or a time when all the things that weren’t right managed to engulf the few that were, and so, even now, even removed from all that, the cheer and the sentimental talk about togetherness gets hard to take. That’s a Christmas prayer for transformation, too. A prayer to let our pain go, to travel lighter, to find the energy to follow a star rather than stay hunkered down in the darkness. That’s a different kind prayer for deep transformation. But a prayer just the same. And I think that has its place at Christmas, too. Because that’s what the Christmas story is, of course. It’s a story of deep transformation. It begins with a world where hope has come to be in short supply and says that God is present in it, and that, therefore, hope should be, too. It begins with a world where so much is wrong that it seems as if nothing could ever be put right, and says that God insists that, indeed, it can be put right, and if we will but follow Him, it will be put right. It begins with a world that looks to appearances and to worldly power, and sees them full of selfishness and danger, and says that God is the antithesis of all of that—and yet that it is He who saves and nothing else. That world, of course, doesn’t sound all that different from our own. Maybe that gives us pause. The Christmas story is an old, old story now—and yet it seems as if the world has not particularly changed in its wake, or at least, not as much as predicted. And I thought: RIGHT ON. And then I looked a little more closely, and realized the editorial was written in 1904. Our problems are not new. And yet, the claim of Christmas is that, even if the problems and shortcomings of the world have not particularly changed, neither has the solution. The love and presence of God are here for us to claim. The deep transformation that God offers us, and that God offers the world in Jesus are still before us. In the eyes of Scripture, Christmas was not simply an event that happened; it was a force that was permanently unleashed. At the other end of the story, this becomes clear. 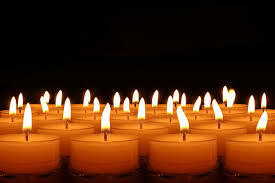 After Good Friday and Easter, Luke describes the day of Pentecost, saying: “They were all together, when suddenly there came a sound from heaven like the violent blast of wind, which filled the whole house where they were seated. They saw tongues like flames distributing themselves, one resting on the head of each, and they were all filled with the Holy Spirit…”(Acts 2:1-4). The story that Luke begins with the sudden pop of the star, appearing in the fields over Bethlehem, announcing the birth of the savior, he continues with sudden wind of the Spirit filling the lungs of God’s people to proclaim and enact the message. We all know that, at Christmas, Heaven and nature sing; Scripture wants us to understand that they’ve never stopped singing, that at Christmas, something decisive, something permanent came into the world, and it has never left. A force was permanently unleashed, and that force has never subsided, and while its work is far from finished, its power is beyond anything that human ingenuity could ever control, much less stop in its tracks. The question for us tonight is, can you and I feel that force? Veterans of the story that we are, can you and I kneel before the manger…not because we have all the answers…and certainly not because we’re perfect—but precisely because we don’t have all the answers and are still working on being the people we hope to become? Doesn’t God’s dream for us, and for the world, come alive somehow at Christmas, in ways that we can still feel, that still pull at us—in ways that still push us? Somehow, in these days, it seems easier to feel how God keeps calling out to us—because the power of the Christmas story still has some sort of claim, some kind of toe-hold on our inmost selves. So much in our world speaks to our heads, but in our hearts, few of us who gather on a night like this can fully deny that claim. Because tonight, somehow, we still feel that force—that force, pulsing through this old story, and that force, deeply alive in our hope for a world renewed, redeemed and at finally peace with itself. Tonight we embody the community of those who live in the light of that story, as surely as the magi lived their lives in the light of that Bethlehem star. Deep transformation is still possible. For us, for the world—indeed, for every dark corner of the globe and the even darker corners of the human heart, deep transformation and the healing love of God are still possible. The star still shines, and the wind still blows. “For unto us a child is born, unto us a son is given: and the government shall be upon his shoulder: and his name shall be called Wonderful, Counselor, The mighty God, the everlasting Father, the Prince of Peace. Of the increase of his government there shall be no end, upon the throne of David, and upon his kingdom, to order it, and to establish it with judgment and with justice from henceforth even for ever” (Isaiah 9:6-7). And at Christmas, through the grace of God, somehow we know in our bones that it is so. May we carry the knowledge with us tonight, and all our days. This entry was posted in Sermon and tagged christmas, isaiah, luke, transformation on December 24, 2014 by maxgrantmg. You see, “The Sisterhood” chronicles the ups and downs of a group of young women who are thinking of becoming nuns. Now, I can’t say for sure just how much reality there is to this reality t.v. show. It seems to me that it must be hard enough to find five young women who are actively considering becoming nuns; however, finding five particularly telegenic young women who are also interested in becoming nuns must be even harder. Some had clearly been feeling a pull toward religious life for many years, while for others it was a more recent feeling, and so they began this period of close discernment in very different places. Almost all of them came from large, close, and deeply religious families—the kind of families where dad stood and offered a formal blessing when it was time to drive to the convent, and the parents shared their long-held hope that God would call at least one of their children into formal religious life. My favorite part of the whole thing was watching each—contestant doesn’t seem like the right word…but…well, contestant—arrive at the convent, and having the sisters come out to greet them. The sisters were unfailingly kind and welcoming. And they sized up each young woman in about ten seconds. Charitably, of course. But dead-on accurately. In the end, as the sisters clearly anticipated, some of the young women decided that being a nun was not for them. More than one felt in all sincerity that Jesus was asking her to come and be his bride. And some realized they still needed more time. But what was fascinating was watching them return home to share the news, whatever it was, with their families. And I was actually quite surprised that the ones who had the very hardest time were the ones who felt the clearest call. These reactions were surprising, and yet: what parent doesn’t understand, at least a little bit? Because teaching our children to love and follow the Lord is one thing, but seeing them love and follow the Lord right out the door and out of our lives is something else, entirely—and it calls for a very different kind of faith. The Bible doesn’t tell us how Mary’s parents responded when she told them the news that she was with child, and that the child was not the product of some youthful indiscretion, but rather a unique sign of divine favor. It must have been sudden for all of them. We often forget that—we who live on the other side of the resurrection, when the great role that God asks this young girl to play in His plan seems like the ultimate low-risk/high-reward kind of proposition. 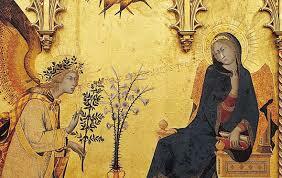 We forget how suddenly Mary is thrown into this whole thing. Generations of artists have treated her with kid gloves – depicted her as a renaissance lady, with a royal blue cloak and alabaster skin and a great open, oval face, and a serenity about her that is as deep as the ocean. And that sounds so…grounded…doesn’t it? But if you look a little closer, it’s clear that this moment is way beyond “perplexing” for Mary, who would have been in mid-teens at this time—in our culture, she would be considered still very much a girl. It’s not a word that particularly suggests serenity—it’s more of a word for a mind that’s suddenly thrown into overdrive—a word for those arguments you have with yourself when you’re trying to get to the bottom of something and don’t know quite where or when it is you’ll come down. And yet, the remarkable thing, of course, is that for all her agitation, for all her mind spinning, for all the suddenness of this breaking news from the messenger of God, this girl Mary doesn’t say no, and she doesn’t say that she needs more time to discern. She says yes to God. For all her questions, for all her doubts, for all the sheer surprise of the whole thing, for all her youth, she still says yes. And yet: don’t you wonder what her parents said when they found out? I just can’t help but ask: how was it for them to learn that the God they had taught their daughter to love and follow was telling her to love and follow him right out their front door? Did they think that God worked that way? Or were they more like the kind of people who expected religion to be about tartan skirts, and not wearing makeup, and obeying your mother and father? Or about cultivating a kind of unobjectionable goodness, or acquiring a confirmand’s knowledge of the basics so that religion would, well, have its rightful place in her life, and her life would have its rightful place in the eyes of all the neighbors, going forward? Is that who they were? If so, then what was it like to see God leading her right out of the respectable world of Nazareth and forward into who knows what? Luke’s gospel never explains it, but Luke writes this in the very next two verses after this morning’s lesson: “Soon afterwards Mary set out and hurried away to a town in the uplands of Judah. She went to Zechariah’s house and greeted Elizabeth” (Luke 39-40). And we’re never told if this is was because Elizabeth was also with a child, conceived under miraculous circumstances…or if the reason was simply that Mary’s parents could not handle what God had handed them. Could not handle the sidelong looks. The smirks. The lively conversation among the neighbors that suddenly went silent as they walked by. So, in the wake of Mary’s news, it seems all but certain that there would have been plenty of agitation in addition to hers, and at least two other people in her house whose thinking was also suddenly thrown into overdrive. I’ve mentioned before the quotation from the philosopher William James, who once wrote, “…in some individuals religion exists as a dull habit, in others as an acute fever” (from The Varieties of Religious Experience). What was it like for Mary’s parents to discover that, thanks to the intervention of God’s own angel, their daughter had caught religion like an acute fever? Don’t you wonder what they thought? I do. To me, that’s also why it’s so important that we tell this story now, just before Christmas Eve—just before the great celebration of God’s coming to be among us so that He might reach us, once and for all. So that our redemption in his undying love would be secured at last. With everything that has sprung up around Christmas, the way it often speaks most deeply to us is not in its festivity, but in its traditions, in its serenity, and in the eloquence of a silent night. Silent nights are so powerful, and especially evocative to a people trying to make it through so many screeching days. We are to be forgiven, I think, if part of what speaks to us so deeply about Christmas is that image of Mary in her royal blue mantle, silently…serenely…taking in the wonder of it all. But it’s supposed to be something much deeper, and if we would truly journey to the heart of Christmas, we need to go beyond that healing silence, however much we may need, or even crave it. We need to say yes to God, who comes to us at Christmas, who calls to us to follow him, and to help build his Kingdom—who dreams for us that as we near the end of our lives, we will be able to look back with a clear conscience and a full heart, and the sense that, when it mattered, we did our very best to follow His rules and nobody else’s. God came down at Christmas so that you and I, and those we love, and those we seek to serve—and in the fullness of time, all people and all Creation—would catch that acute fever that Mary had. God came down at Christmas so that for all our questions, for all our doubts, for all the sheer surprise of the whole thing, we might say yes to Him. Take us where it may. Ask of us what He will. God came down at Christmas so that whether our faith leads us out the door or right back in, off to the convent or onto some entirely different stage, among the respectable or the downright scandalous, all our paths would lead us back to Him. At Christmas, we celebrate the beginning of that journey. And we pray for the grace and courage to set out in search. This entry was posted in Sermon on December 19, 2014 by maxgrantmg. In January 1980, my parents bought a sweet, but unprepossessing little house in Brooklyn—the former carriage house of a church that was itself limping along at the end of our block. On the day we moved in, the ground floor of the house was a three-car garage. When my father pleasantly told one of our new neighbors that we had big plans for the house, and that we were going to fix it up, and convert the garage into our living room, the neighbor started arguing. It turned out he had one of the three parking spots, and wanted to convince us that the place was better off being left exactly as it was. That turned out to be a minority view. Over the next year or so, my parents began talking with architects and others about their plans for a major renovation. And time after time, the architect would arrive and try to talk them into changing everything—into tearing the house down and starting over. But I can tell you that, to him, it mostly meant a new three-story house on the front of the lot, with our little carriage house becoming a mother-in-law apartment and laundry room at the back. Eventually, of course, the plans came together and what emerged was a wonderful place—thanks almost entirely to my mother, who could see potential that nobody else could see. But it was an education for all of us. And it’s no exaggeration to say that at almost every step of the way, the idea of renovating an old house—of repairing what was broken and giving it new life—seemed downright crazy to many. It was then I learned that repairing what is broken can be a radical act, indeed. Throwing it away—tearing something down and starting over simply because, well, why on earth wouldn’t you just do that?—makes a lot more sense to a lot more people. This past summer, as Tony Izzi was putting the finishing touches on a car he had been lovingly restoring for several months, Grace asked me if his car was broken. “Why doesn’t he want a new car?” was her response. Time will tell, I guess, if Grace comes to understand this particular kind of fun. As I said, repairing what is broken can be a radical act, indeed. This morning’s Scripture from Isaiah is also, at its heart, a promise about rebuilding. “They shall build up the ancient ruins,” he says, “they shall raise up the former devastations; they shall repair the ruined cities, the devastations of many generations” (Isaiah 61:4). And what he’s talking about is the rebuilding of Jerusalem. He is imagining the day when God’s people, exiled in Babylon when these words were written, will be freed to return home—freed to get about the work of rebuilding their lives—rebuilding their civilization—rebuilding the walls of their city, and of the Temple, which had become the center of their faith. What Isaiah is imagining is a new start, of course, but not a tear down. It’s an act of renewal, a renovation—a faithful process of bringing new life to old stones. We tell it at Christmas because of its opening lines, which read, “The spirit of the Lord God is upon me, because the Lord has anointed me; he has sent me to bring good news to the oppressed, to bind up the brokenhearted, to proclaim liberty to the captives, and release to the prisoners; to proclaim the year of the Lord’s favor…” (61:1-2). It is a reasonable job description for Jesus, of course. In fact, Luke’s Gospel even tells us that it is these very words that Jesus reads in his home synagogue at Nazareth, before he shocks them all by adding: “Today this Scripture has been fulfilled in your hearing” (Luke 4). The hometown crowd doesn’t like that. They don’t like that the carpenter’s son, who was a nice enough kid but always a little out there, is suddenly looking at the old, old promises of Israel’s prophets and acting like he’s looking in the mirror. They don’t like to have the ancient promise of the messiah mocked in this way, which is, for sure, how it sounds to them, because Jesus the carpenter’s son isn’t anyone’s idea of a messiah – except maybe for his mother’s, and there were plenty of rumors about her in her own right, and about that convenient little out of town trip down to Bethlehem all those years ago…. The people of Bethlehem, the hometown crowd, doesn’t like hearing these words from Isaiah quoted back at them—not by him—not by Jesus—not when he says that today these words have been fulfilled in their hearing because, Lord, look around: how could that be? The messiah they were hoping for was a lot more like your typical leading man. To hear Jesus claiming the mantle? That was like sending in Ryan Gosling to star in a John Wayne movie, and…just…come on…. And that’s true because, on some level, they are seeing what’s ahead, what’s on the horizon, as a massive tear-down. That Rome’s unjust occupation will be torn down. That the misery of the people will be torn down. That the power and influence of the faithless collaborators among them will be exposed and torn down. That a great general, a military commander will come from among them, somewhere, and yes, maybe he would be as improbable as King David himself had been at first, or even Moses…but wherever it was he would come from, he would be tough as nails and destined to win. And that’s what they were looking for. Because that tearing down was going to be glorious. Truth be known, they could hardly wait for the messiah to show up with his wrecking ball. And so when Jesus reminds them about Isaiah, reminds them about rebuilding, and calls them to renewal, maybe the real issue isn’t even that Jesus suggests that he is the fulfillment of that Scripture. Maybe the real issue is that what Jesus says, and what Isaiah says, is that the real work is the work of rebuilding. The work of repairing. Much as we dream of starting fresh, starting over—of sweeping aside what’s broken and moving on—the fact is, we can’t. And we can’t because most of what’s really broken in our world is in ourselves. 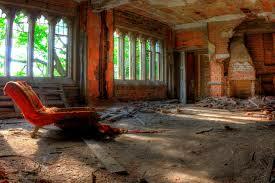 We can’t just throw away our own brokenness, however much we might like to. By way of analogy: a story caught my eye this week about how Atlantic City is falling on hard times, again, with many of its casinos already closing or soon to close. It has gotten so bad, in fact, that not only has Donald Trump pulled up stakes from Atlantic City. He sold his casinos there about two years ago, before things got bad. But now, he is apparently suing the people who bought his casinos so that he can have his name removed from the buildings entirely so that his name won’t be associated with their seemingly inevitable bankruptcy. Now, in fairness, most of us don’t have to think of ourselves as a brand the way Donald Trump does. And yet, on some level, it comes across as if he’s trying to wipe his fingerprints off of the city and simply sneak away. Whether it’s a bad investment, or a bad marriage, a bad career choice or a bad attitude, in general, who wouldn’t want to sneak away? And yet, however much we might like to, we can’t just throw away our own brokenness—and though it is hard to admit, so much of what’s broken in our lives comes from within us, and not from outside us. The real bankruptcy is us. As a result, even when we succeed in sneaking away, so often we find that, wherever it is that we gravitate to next, the same old problems return. Because the real problem is that we have not changed. Christmas is a way to acknowledge the coming of a new and better world. A new and better you and me. The language of the Church in these weeks before Christmas is often the language of the end of the world—the language of tearing down, of a raging fire that will destroy all that is unworthy and refine all that is worthy in us and in our world. But today, we are called to remember that the real work—the real message of Christmas—is not pointing to a work of destruction, but rather, toward a labor of love…toward a patient rebuilding….toward a dedicated repairing of all that is broken in the world…beginning with all that is broken within us. The Messiah comes, not as a general who will sweep away all oppression, but as the Holy Child, whose vulnerability will teach us to see the vulnerability in all of us, ourselves included, and teach us to become, not warriors, but peacemakers. The Messiah comes as one who will destroy all that is false in the world, and in our lives, not with the might of his hand, but with the depth of his truth and the wonder of his love. He comes not to tear things down, but to lift us up, because he sees potential in us that maybe nobody else has ever quite managed to see. He comes because he knows that there is life in us yet…and, namely, that there is life in us, if only we will come to recognize the life that is in him. This entry was posted in Sermon on December 14, 2014 by maxgrantmg. For me, personally, over the last few days, it has been so very strange and so particularly unsettling to see t.v. coverage of the streets of New York filled with people, weary and hurt and baffled…and marching peacefully through places that I know well. They have been marching in places like Times Square and Grand Central Station, and even the 79th entrance ramp to the West Side Highway. That last one is hardly a cherished landmark, but, as it happens, it is a block away from a school where I used to work, and so it was strange to see cameras and crowds and news happening in a place that feels so powerfully familiar. Last week in this time, I preached about weariness, and about how strange and yet fitting it is that the weeks before Christmas, the season of Advent, might begin on that note. Weariness comes from many different directions these days, and we acknowledged that. We did not acknowledge Michael Brown or Ferguson, by name last week, but I also had them in mind, and maybe you did, too. And now this week, we have another situation, surrounding the death of Eric Garner on Staten Island—a situation that voices as different as Jon Stewart and Bill O’Reilly have both said they find troubling. So, seeing those pictures on t.v. was a reminder to me about how we are all caught up in these questions, and how we are all surrounded by the challenge of how to respond. If we are inclined to think that what’s happening on the ground elsewhere need not be on our radar, well, it seems fair to say that the ground might just be shifting underneath our feet. Of course, some of us here today can remember another December 7th …December 7, 1941…when it also must have seemed as if the ground was shifting underneath everyone’s feet, and the problems surrounding people in other places suddenly became not so nearly far away. It is heavy, indeed, to think about all that. Confronting it daily is, of course, much, much heavier. “WE CAN’T BREATHE” said a headline in the Daily News. So many people feel as if they can’t. And yet, as we return to the words of Isaiah this morning, it’s clear that Isaiah can. That Isaiah is not weary. Isaiah is talking about new life this morning—about trees that were cut off at the root, leaving only the stump behind, suddenly growing new branches…suddenly showing signs of life—and it’s an image of old, abandoned promises being rekindled, re-inhabited. And instead of looking around and despairing about everything that is not right, Isaiah talks about the remarkable one who is to come, in whom God’s people will find a way to make things right, at last. His eyes are on the future, and what Isaiah sees is good. The bad marriage of God’s people and the world, which seems to bring out the worst in everyone, will be transformed, and a second honeymoon will one day come. Liz and I were once at a dinner party where another couple we didn’t know began squabbling right in front of everyone. It was all very subtle at the beginning. One of them would tell a story or make a point, and the other would smile at the rest of us, and then politely correct some detail. But as the evening wore on, the smiles were fewer, and the corrections grew more pointed in both directions, and I began to wonder what would happen the minute they got in the car to go home. We never did see that couple again, and it seems like mere curiosity on my part to ask the host from that evening about what has become of that unhappy couple in the years since then. But I’ve always hoped they were able to find a way forward from where they were. Some way to be transformed together. To fall back in love. Isaiah might jump in here and remind us that, in fact, the road forward is a winding road, a road that loops backward into the past before it turns and heads over the horizon into the future. For Isaiah, transformation, becoming something new, is also a process of un-becoming, a kind of dismantling of the person we have learned to be in order that we might be free to become a new person. Many years later, the Apostle Paul would say, “If anyone be in Christ, he is a new creature” (2 Corinthians 5:17). And Isaiah imagines a world transformed by the Holy One, and gives his vision of the peaceable kingdom that will unfold once the Holy One, God’s messiah, at last arrives. “The wolf shall live with the lamb,” he says, “the leopard shall lie down with the kid, the calf and the lion and the fatling together, and a little child shall lead them. The cow and the bear shall graze, their young shall lie down together; and the lion shall eat straw like the ox. The nursing child shall play over the hole of the asp, and the weaned child shall put its hand on the adder’s den” (Isaiah 11:6-8). It is a stunning vision, that peaceable kingdom. A vision of new creatures, indeed. If the wolf and the lamb, the leopard and the kid, the calf and the lion and the fatling shall learn, one day, to lie down together, it is not because they simply decide that, going forward, they are going to love one another. The peaceable kingdom will only come as the old nature gets patiently dismantled, and the old antagonisms of the way things are enter a process of un-becoming, a journey backward, and then forward, that will slowly lead beyond the horizon to a new, transformed Creation. Why does Christmas have the power over us that it does? Maybe it’s because it has power like no other time of year quite does – a power to take us back, to remind us of the people we once were – to put us back in touch with the hopes we once held, and the visions that moved us. Whatever we have become in the years since, whatever life with all its challenges and indignities has done to us, at Christmas we find a way back—a way back to a moment when our joys were more pure, and our loyalties less divided. If we want, we can let this be a short, nostalgic little breather before we get back to the grind. But Isaiah seems to point to another possibility. Isaiah seems to suggest that in these days, as we reconnect with old promises, and old dreams, we might find the energy to un-become some of what we’ve let ourselves turn into—that we might dismantle some of what we have constructed, and if we have somehow become a wolf, or a leopard, or a lion, we might yet be part of a new Creation, a part of the peaceable kingdom that is coming, and which will be running along different lines. But in a very real way, the peaceable kingdom depends on how we learn to un-become the people our petty shortcomings and our grievous sins have turned us into. And the peaceable kingdom depends on how we dismantle the world that our brokenness has taught us to build. More and more these days, I’m feeling that call to dismantle what is broken. What’s broken in the world and what is broken in me. More and more, I find myself honor-bound, conscience-stricken, and just plain ready to try to see those things clearly. I love Christmas. But maybe it’s time we gave up our hope of a future without coming to terms of what it is in us and in our world that got us to this place where we are. Because only as we take account of such things that we can expect to see the road turn toward a place of wholeness, a place of peace and justice and hope, a place where the shalom of God will permanently dwell. These are days when, in so many different ways, it seems as if the ground is shifting beneath our feet—days when so many of God’s children choke to say that they can’t breathe. Perhaps Christmas seems like a temporary antidote to all that unpleasantness. But this morning, Isaiah, at least as the Church has read him, says that Christmas is not just a temporary antidote, but a permanent solution. It’s not a breather. It’s a call to action. And especially, it is a call to action for those of us who can breathe in these days to come to the aid of those who cannot. And at Christmas, the part that jumps out at us is the part about the child. That child leads us to un-becoming, so that we might learn to conduct ourselves aright. That child leads us into the patient dismantling of all that has lead us astray. That child comes to guide us, so that in Him, we might finally become the people of his way. That child comes to begin a whole new era, when the old divisions will be no more, and peace with justice will reign and you and I will be transformed with all Creation. That child comes so that we all might breathe again. Lord, may it be so. May it be soon. May there be a place for me there…and one for you…and one for each and every one. This entry was posted in Sermon and tagged advent, eric garner, ferguson, icantbreathe, isaiah on December 6, 2014 by maxgrantmg.